Create a project using the theme: Beach/Summer. 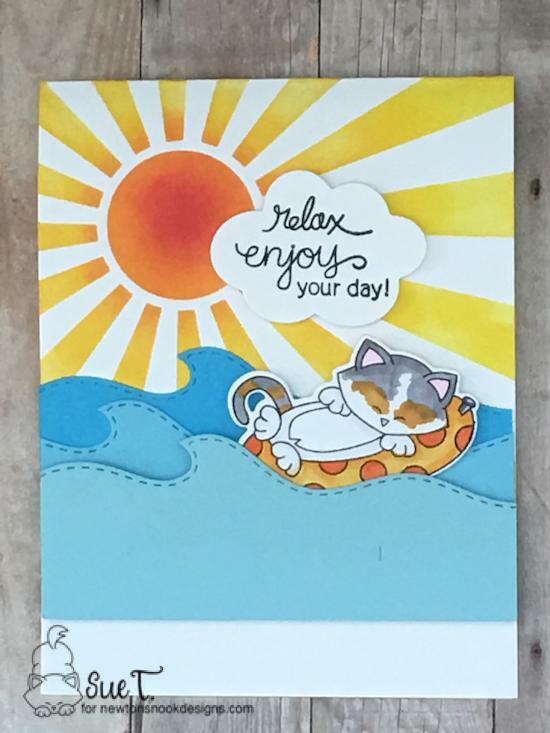 Diane Morales water colored this watery background then die cut her sandy ground using the Sky Borders die set. 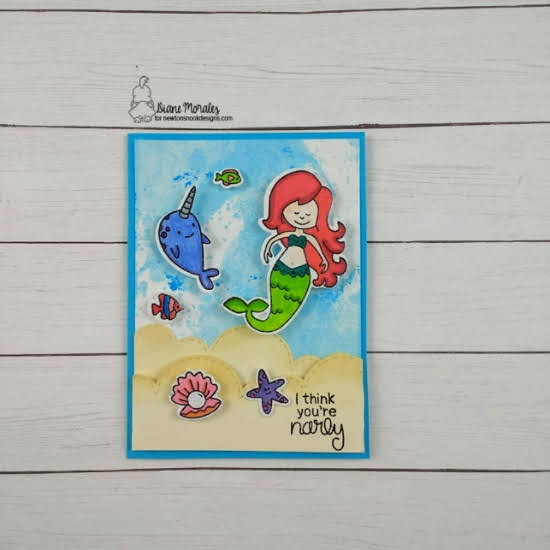 She colored images from the Narly Mermaids stamp set and die set and adhered with dimensional foam. Such a wonderful underwater scene! Emily Lauritzen created her background using the Sunscape stencil. She inked up extra waves and cut out to add dimension. She colored her cute kitty from the Newton's Summer Vacation stamp set. She framed her darling scene using the Frames & Flags die set. Such a bright, colorful project! Sue T. also used the Sunscape stencil to create her sunny background. For her waves she die cut waves using the Sea Borders die set using different colors of card stock. 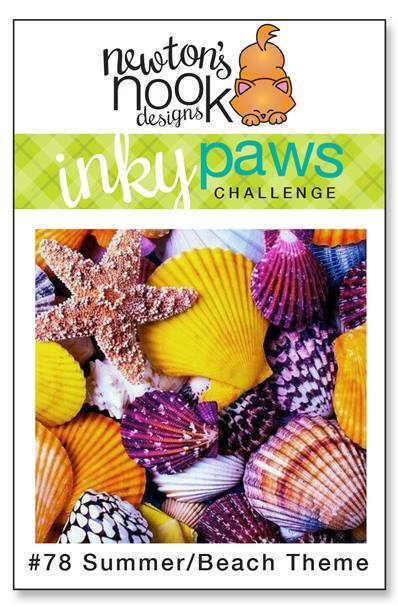 She colored her calico kitty using the Newton's Summer Vacation stamp and die set. Newton certainly looks content lounging on his polka dotted floaty! Frames & Flags die set to frame her scene! Wow! 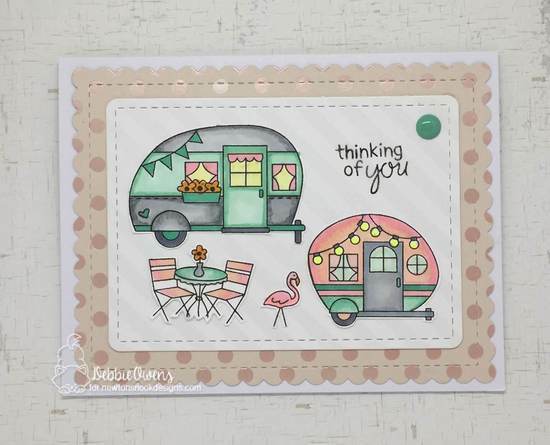 Debbie Owens creates this sweet card with her vintage-looking travel trailers from the Cozy Campers stamp set. She places her campers on a subtly white-striped pattern paper die cut and layers it on a soft pink polka dotted paper. She uses the Frames & Flags to cut both papers for a fun layered look. I hope these projects have inspired you to play along! Remember, you have until this Friday,August 17, 2018 to enter. There's a prize involved too, so don't delay - view all the entries and see more inspiration on our Inky Paws Challenge here!